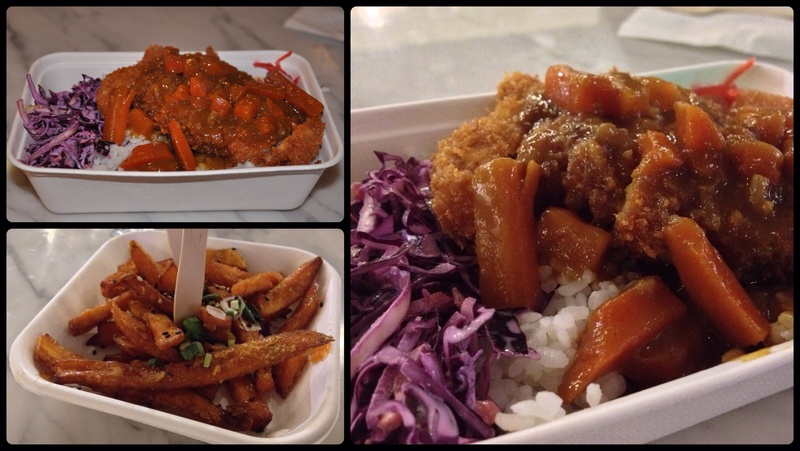 This week was the start of a new rotation of street food vendors at Trinity Kitchen. We had to say a sad goodbye to the Donastia Social Club, DogTown London, Crepe Lucette and Fish&, and welcomed the new in the forms of Yu Kyu and Magnificent Milkshake Company. The other three street food holders are the popular Original Fry Material (who are continuing to feed Leeds for the next month or so), The Marvellous Tea and Cake Shed and Leeds favourites Manjit’s Kitchen. They’ll all be gracing Leeds with their presence until February 23rd. I went on Tuesday evening as part of the Trinity Kitchen Preview Evening with other like minded food lovers/bloggers/social media people, many thanks to Wendy, the Leeds Guru for the invitation!! I’d already read on Twitter that a Tonkatsu street van would be joining the street food fold at Trinity Kitchen, and as a huge lover of all things Japanese, in particular their food, I literally jumped for joy at the prospect of getting my mouth around some YUMMY tonkatsu!!!!! 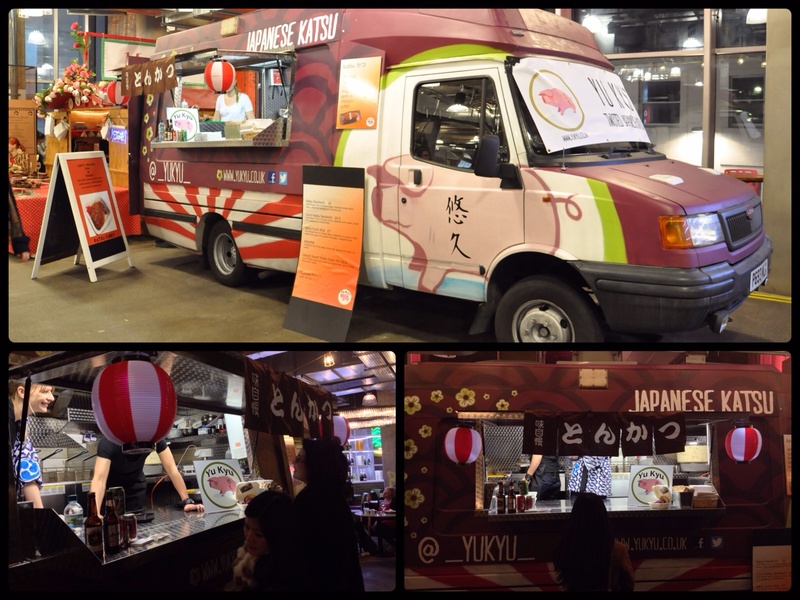 The bringers of the tonkatsu is Yu Kyu, one of the first, if not THE first mobile Japanese tonkatsu food kitchen in the UK. Based in London, they specialise in delights covered in lovely panko breadcrumbs and deep fried till golden, served in the form of a burger or with the traditional rice, curry and pickled ginger. They can cater for the carnivore with pork and chicken, also the non-meat eater with pumpkin and sweet potato. After eating tonkatsu in the UK and in Japan I couldn’t wait to try out Yu Kyu‘s take on one of my favourites. When the time came I was giddy like a little school girl when ordering my food, I was that excited and quickly ordered a Tonkatsu (pork) curry rice (£7). Cooked to order, on the first mouthful it was everything I’d wished for!! Moist sweet pork, covered in a crisp panko breadcrumb crust, fluffy rice and a decent Japanese curry sauce. All this accompanied by a red cabbage slaw and customary pickled red ginger, which provided the dish with just enough sharpness to cut through the curry sauce. It was excellent to the point where I said I could easily wolf down another portion, even before I’d finished the first! My friend had the Kabocha with curry and rice and this was equally as good!! We also tried some of their glazed sweet potato fries, they were good for sharing as they as were, as described quite sweet being glazed with a sweet soy sauce. Their menu costs between £3.50 – £7, well worth it I think! I have a feeling, well to be honest I know I’m gonna to going back!!! 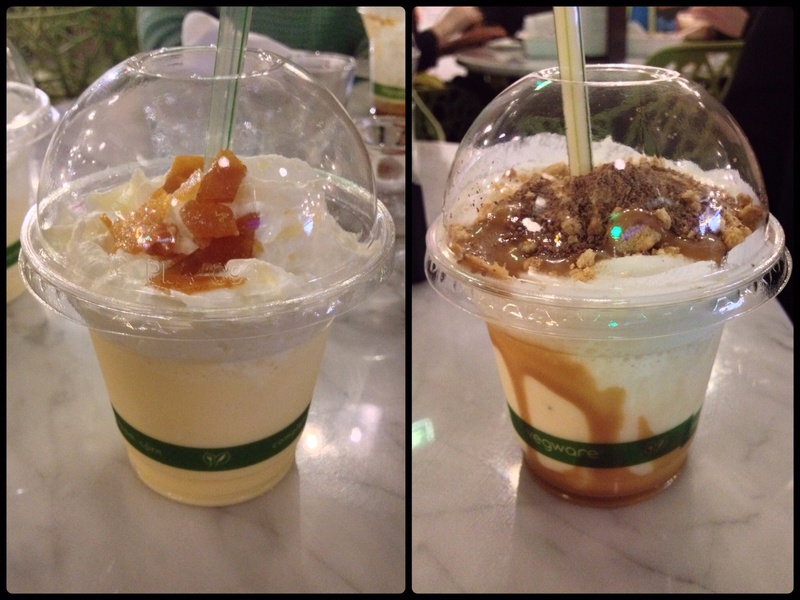 The other new street food vendor is Magnificent Milkshake Company with their take on milkshakes based on classic desserts. These purveyors of the milkshake hail from Suffolk and are bringing with them their individually blended milkshakes using all natural ingredients. We sampled their Banofee Pie and Creme Brûlée, both went down well and were certainly a good dessert option. I tried the Creme Brûlée and it was lovely and creamy, with a definite hit of vanilla and lots of caramel shards on the top. Ranging from £3 for one of their ‘Baby’ shakes, to £4.50 for a large shake. 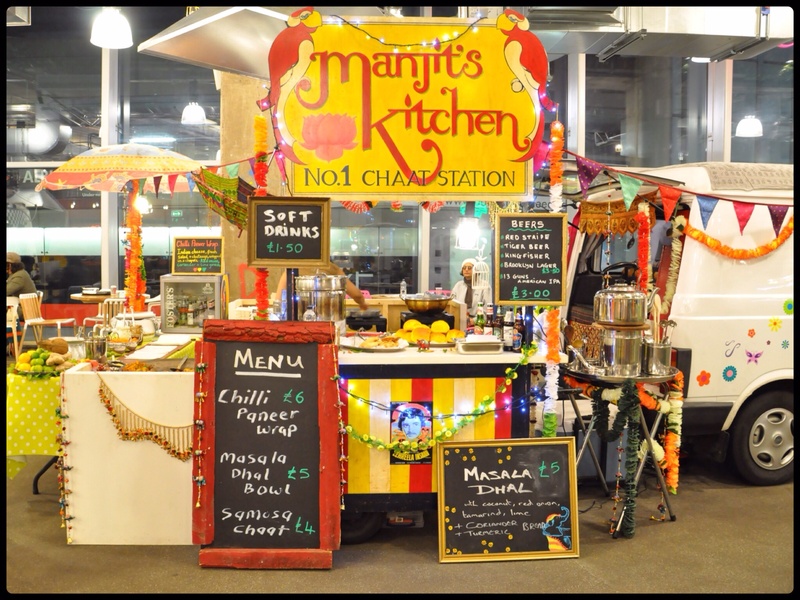 The last three street food vendors are old favourites now, Manjit’s Kitchen, to Leeds folk they don’t need any introduction as they are well known by lovers of street food. If you don’t know of Manjit’s Kitchen, they basically produce fantastic Indian vegetarian street food and snacks and are loved by Leeds folk a plenty. I opted for their Samosa Chaat, after eating my tonkatsu curry rice. 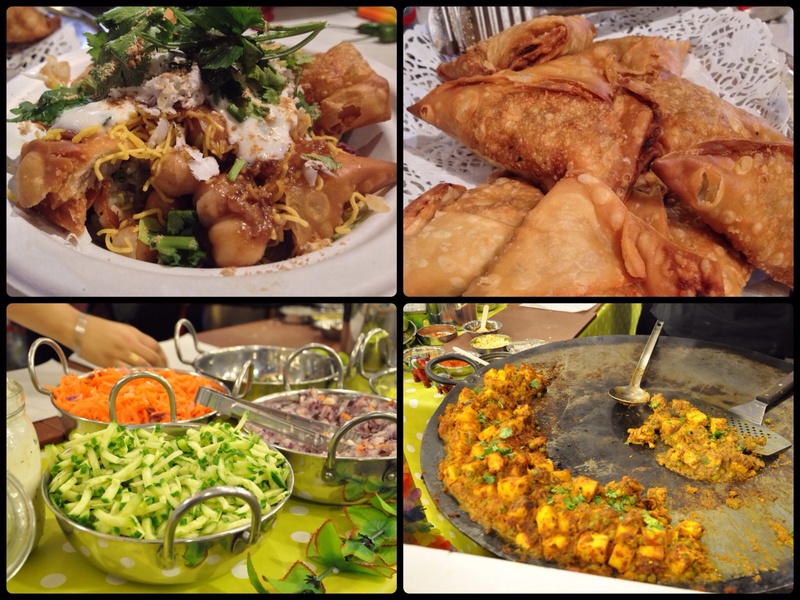 It was so tasty as expected with Manjit’s, a great samosa with a little kick of heat here and there, accompanied with the chaat which had loads of chickpeas and coriander. Just £4, it’s great for lunch, a snack or part of a bigger meal. 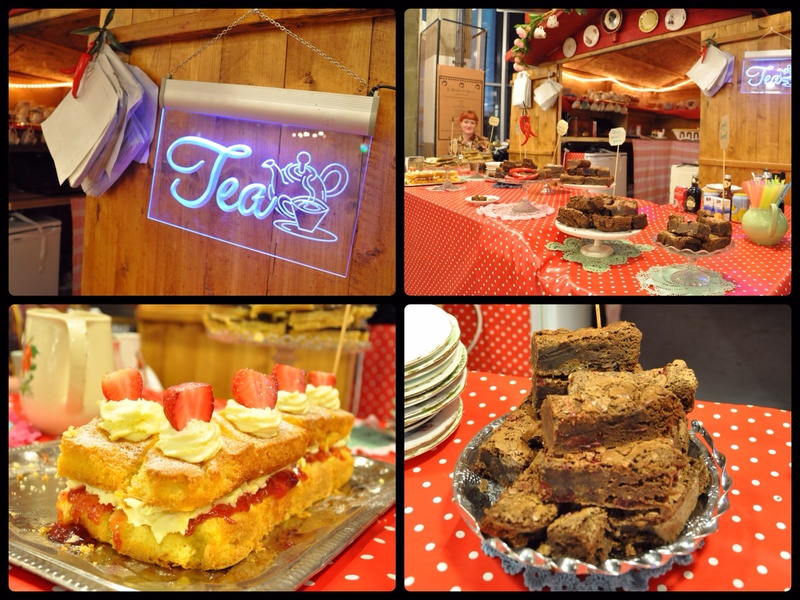 Also back is The Marvellous Tea & Cakes Shed who were one of the original five street food vendors at Trinity Kitchen. As soon I as walked even within eye-shot of the stall I spied a Victoria sponge cake, my absolute favourite, so much so it was my top tier on my wedding cake. 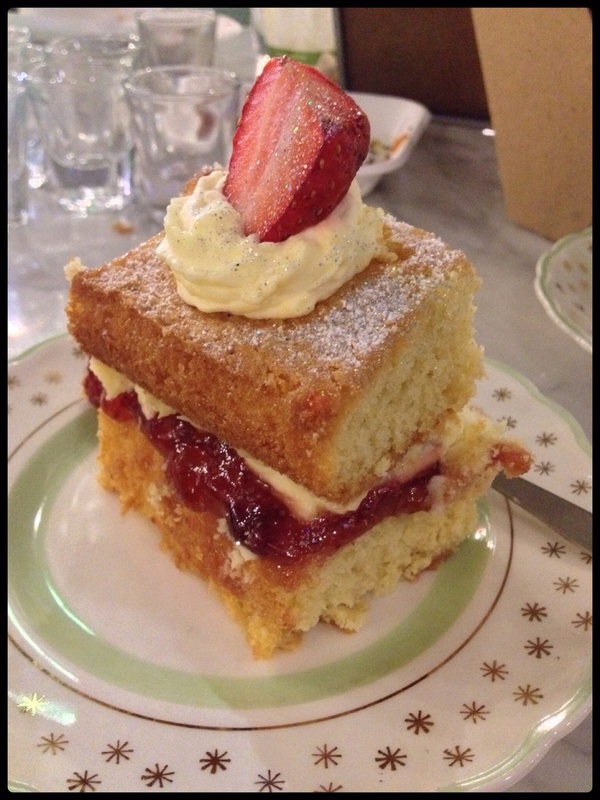 A gorgeous sponge with plenty of strawberry jam and cream, really what more could you ask for?? Ok, it came with their usual sprinkle of glitter and I had it with a lovely cup of tea, so for me, it was wonderful. I know, to some I may be easily pleased but it was GOOOOD!!! Last but certainly no means least are Original Fry Material, these rather handsome chaps have won the hearts of many in their first month at Trinity Kitchen, me included!!! I had their English Brekkie Muffin which was AWESOME!! Yeah, this is no bog standard breakfast muffin, the lads at OFM make their own handmade sausages from scratch using free range Blythburgh pork shoulder, herbs and spices. It works so well with a lovely golden runny egg, cheese, dry cure streaky bacon and a yummy English muffin. 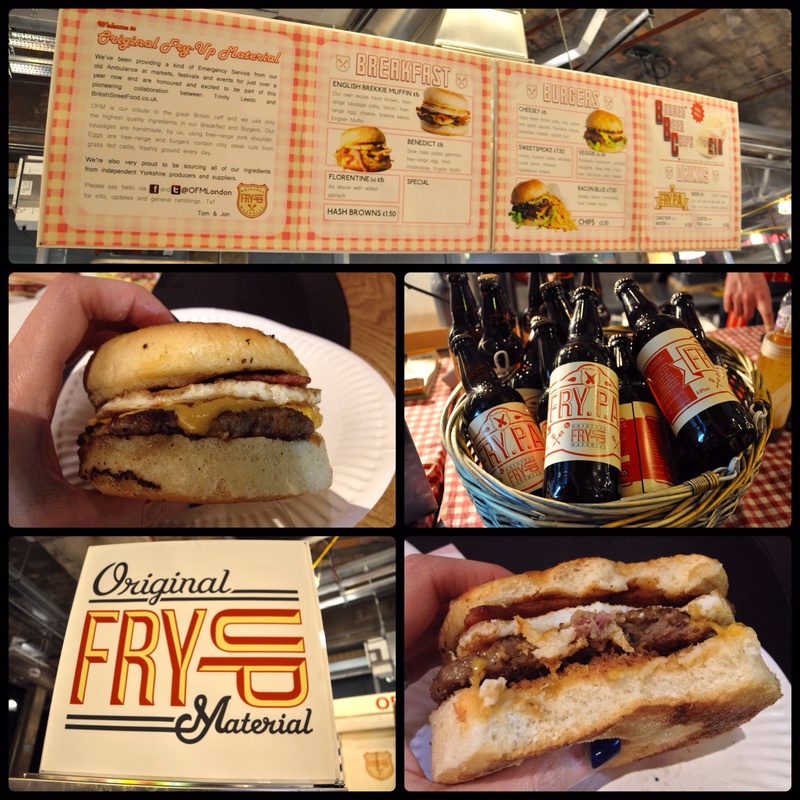 For me, they are great at any time of the day – breakfast, brunch, lunch or dinner!!! They even have their own Pale Ale especially brewed by Leeds Brewery. As you can tell, I’m a big fan of the independent street food vendors at Trinity Kitchen, but I really don’t make this stuff up. They are REALLY GOOD and if you haven’t tried them out you should!